Umenishiki Bock is a 7% dunkler bock (or dark bock) from Umenishiki Yamakawa, and is produced all year round. For those interested in how it’s made, Umenishiki Yamakawa roast various different malts for different lengths of time and mix them all up. Umenishiki Bock also won silver and gold medals at the International Beer Competition back in 2008 and 2009 respectively. One of the darkest dunkler bocks I’ve come across. Even though Umenishiki Bock is a dunkler bock, the depth of colour when it is poured out was surprising as it appeared to be almost stout like. The deep brown, almost black, body had an off-white, tan head on top that was solid and a good one or two fingers deep. You could have stuck a spoon in it and it would probably have stood upright. But I didn’t, because I was too busy smelling Umenishiki Bock and trying not to drink it. The coffee and liquorice aromas were by far the strongest coming off, with a slight smoke coming behind in second. If you’re looking for cough syrup then I strongly recommend Umenishiki Bock – its thick body comes with some weird medicinal taste that I couldn’t shake off during drinking. It reminded me of a medicine called Dimotane that I was forced to consume as a kid when I had a cough. The sweetness from the malts, combined with the thick syrupy texture, makes Umenishiki Bock slightly tough to drink but weirdly nice though. 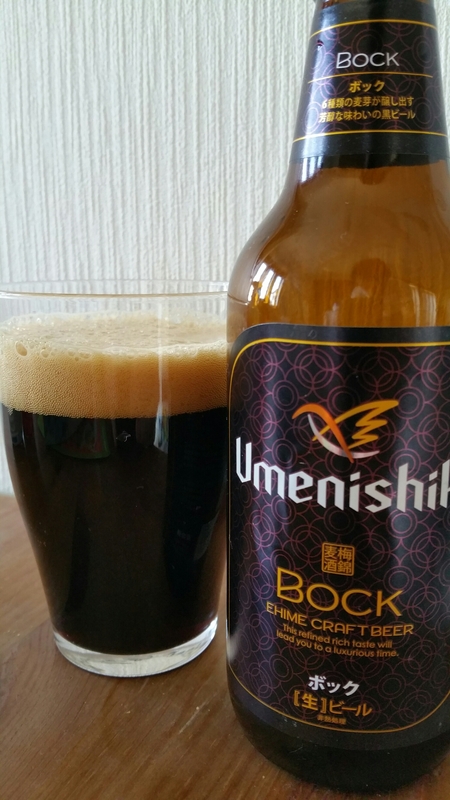 Umenishiki Bock is more stout that bock, and perhaps more medicinal than beer. Good for those who like their beers sweet and thick. Umenishiki Bock can be bought from these shops here listed on the Umenishiki Yamakawa homepage. I got my bottle from Queens Isetan in Yokohama as it seems to be in stock there all-year round. It can also be bought from GoodBeer.jp here.